As another year comes to a wrap, we inevitably enter List-Making Season. In 2018, food tech company JUST is sweeping the “Best of” lists, earning accolades from food industry insiders, tech-types, and health-enthusiasts alike. Food Dive has named JUST Co-Founder and CEO Josh Tetrick Executive of the Year in their 2018 awards. He joins the ranks of Pepsi’s CEO Indra Nooyi, who won in 2016, and former Tyson CEO Tom Hayes in 2017. Since Tetrick founded the company with Josh Balk in 2011, JUST has brought plant-based mayos, dressings, dips, cookie dough, and eggs to market. As Tetrick put it to Food Dive, JUST is trying “to reach people who are intrinsically good but are too busy, too poor, don't care, whatever it is—which is to say 99.99% of the world—to figure out a way to get them to eat well." The darling of JUST’s lineup this year has been the plant-based Just Egg. A year after its launch last December, Just Egg has gained distribution in US restaurants, cafeterias, and grocery stores, has cracked into the European market through a partnership with Italian egg company Eurovo, and has even launched in Singapore. Mung beans get a makeover. This egg substitute uses mung bean protein to create a nutritionally-comparable substitute to the mighty egg. (One major bonus: it’s much lower in cholesterol.) 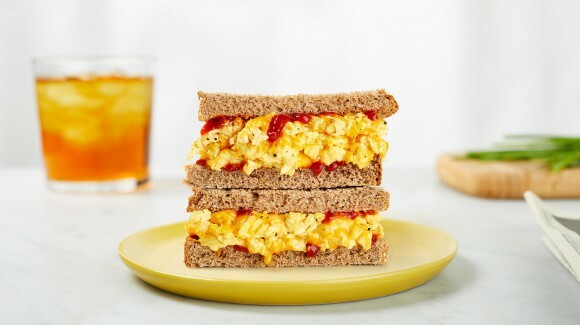 The best part about this egg substitute is that it actually scrambles up like an egg. It’s crazy. “Crazy” or just the future of food? Potato, potato. Speaking of the future, JUST plans to bring their chickenless product line full circle in 2019, debuting clean chicken in some high-end restaurants. Expanding their portfolio to include cell-cultured meat as well as plant-based products is a logical step in their broader strategy. JUST is not simply making new products. They’re making new platforms for discovery. As Tetrick told Food Dive, "We're trying to be a toolkit company to enable us to do all sorts of different things, which is a much bigger bet and more challenging, but a bet that we think is worth taking." With the right set of tools, we can build a more just and resilient food system. Top of the to-do list for 2019. Hear Tetrick in conversation with the CEOs of clean meat companies Memphis Meats, BlueNalu, and Fork & Goode at The Good Food Conference 2018. In this panel moderated by Business Insider’s Erin Brodwin, Tetrick joins Uma Valeti, Lou Cooperhouse, and Niya Gupta to discuss strategy, achievements, and frustrations in building the emerging clean meat industry.